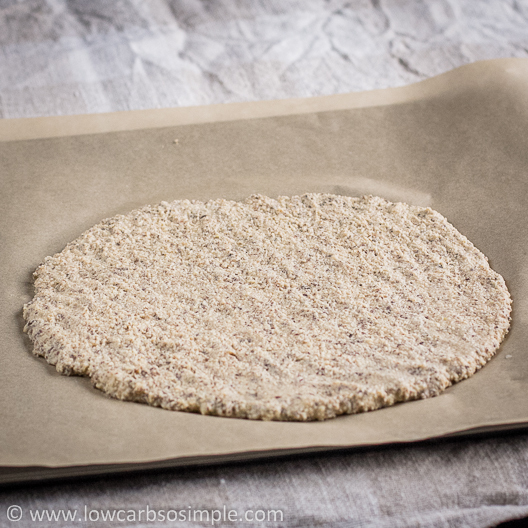 Flatbread | Low-Carb, So Simple! This delicious one-bowl bread is a great option when you want some soft, fresh bread quickly and don’t want to put too much effort into making it or use any machinery. The bread is simple to convert to dairy-free. 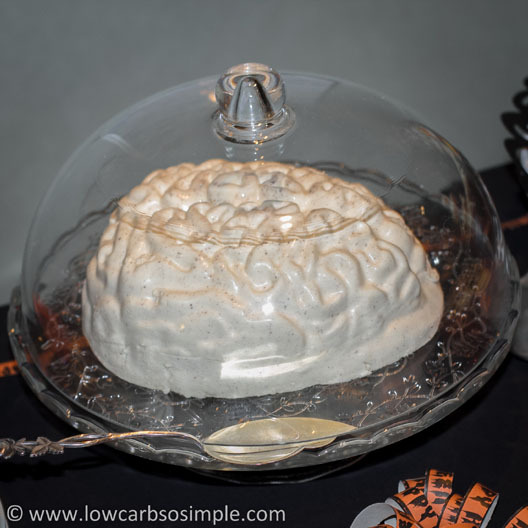 More of that and also some fascinating tips and photos from my Halloween birthday party in the end of the post. Preheat the oven to 300 °F (150 °C). Mix with spoon until the batter is smooth. Pour the batter on the baking sheet lined with parchment paper. Spread the batter evenly with spoon so that it is approximately 0.4 inches (1 cm) thick. Bake for 25 minutes, or until a toothpick inserted in the center comes out clean. Let cool slightly and cut into pieces. Serve warm. There is really no need for tips — this is so easy and foolproof recipe. One note though: don’t wait after preparing the batter but pour the batter immediately on the baking sheet lined with parchment paper. 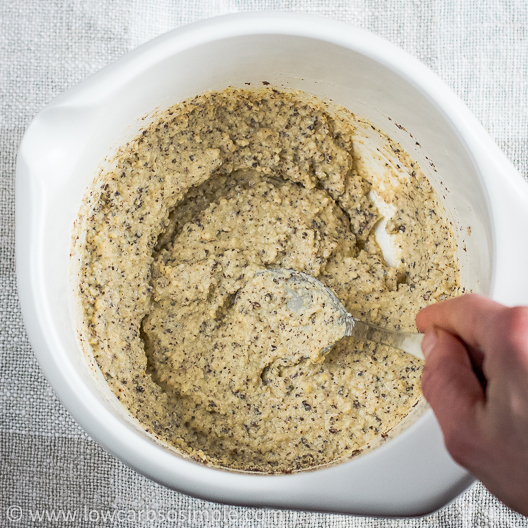 If you wait, the flax seeds make the batter firmer and thus more difficult to spread on the baking sheet. Even this is not a problem, just use wet fingertips to flatten the batter if it get’s too thick. It might be a good idea to grind the flax seeds yourself because the commercially ground flax seeds go easily rancid. So, when you buy ground flaxseed from the store, the stuff is basically already rancid. 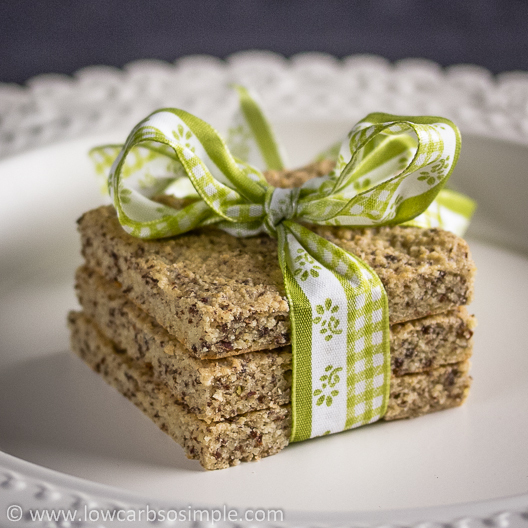 Please note that the recipe calls for ground flaxseed which has rougher texture than milled flaxseed. Just throw all ingredients in a large bowl. 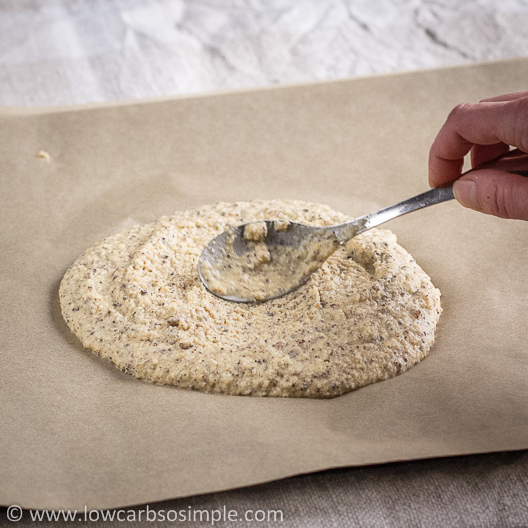 Pour the batter on a baking sheet lined with parchment paper. Spread the batter with spoon until it’s 0.4 inches (1 cm) thick. If the batter has gone thicker for some reason, you can also flatten it with clean, wet fingertips. And here is the bread straight from the oven. The appearance didn’t change much, did it? I have made several variations of crisp bread, but this time I was after something thick and soft — flatbread. I thought almond flour would be great in creating soft texture. Heavy cream might also help give richness and certain succulence. For that “whole grain” look, I chose to add some ground flax seeds. I didn’t want to use whole flax seeds, neither milled flaxseed but something ground with a little bit of texture. Ground flax seeds were just ideal. Then some eggs for binding the batter and a tad of salt for fuller flavor and my first experiment was on its way to the oven. My basic idea was to keep the bread simple. No machinery needed, just one bowl where you mix everything together with spoon. I also made a couple of experiments where I added some unflavored whey protein for firmer texture but soon gave it up. It didn’t bring the wished result but just made the bread too dry. The bread was just so much better without it. As I again noticed, it’s so funny how the best things are the simplest. This is relatively small bread, so if you are feeding a bigger bunch of people, you might want to double the size. Don’t pour all the batter on one baking sheet though, but rather use two baking sheets. What I like to do to further enhance the flavors is to add 5 drops liquid stevia. Please feel free to use garlic, herbs or other seasonings to your taste and liking, especially if you are not going to top the bread with butter, cheese, ham or veggies. The bread tastes also great with jam or sweet spread. If you don’t tolerate dairy, just substitute coconut milk or coconut cream for heavy cream. You can use this bread as pizza crust. Just prebake it first before adding the toppings. Next I’m going to try baking the batter as small mounds to get rolls. If you want to take things a bit further, you can gently heat the batter in a saucepan and eat it in place of oatmeal or hot cereal. Just add more cream or water if the mixture gets too thick. 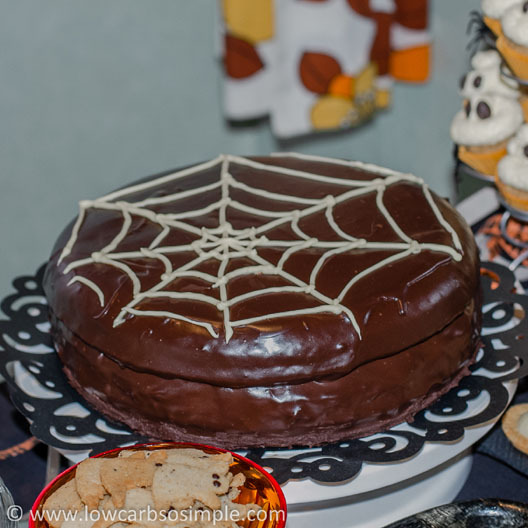 This week’s post was relatively short — I’m still recovering from the flu and my combined Halloween and birthday party and all the effort needed in those preparations. I made all by myself everything starting from the sugar-free ketchup to the sugar-free white chocolate. 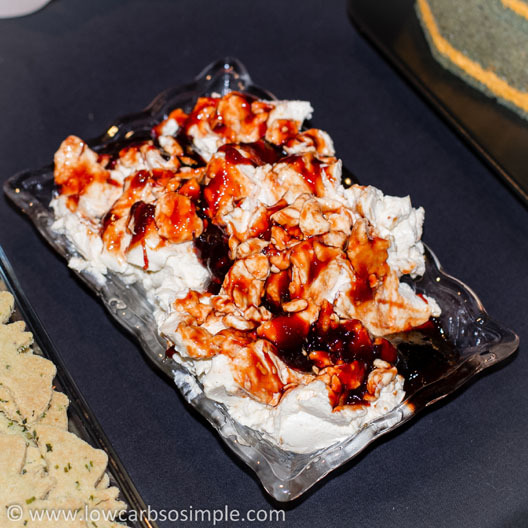 All the food I served was sugar-free, gluten-free and low-carb. 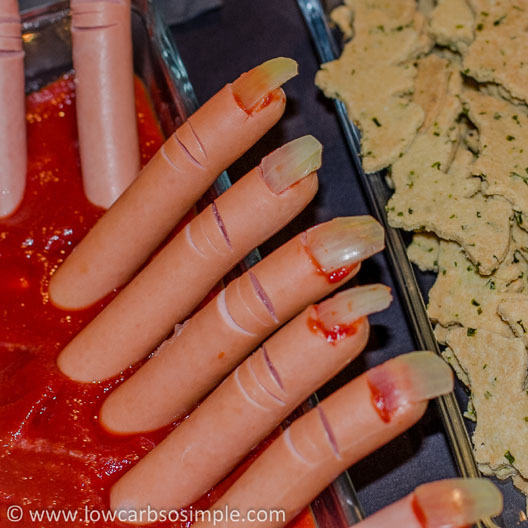 I loved every second making the creepy food and enjoying the company of my lovely friends. Below some photos of the food I served in the party. I’m sorry about the bad quality of the photos, I had to use flash because I wanted to take the photos quickly and not let the hungry guests wait for the food. The credit for the idea of the fingers in the first photo goes to Jojoebi Designs. I came across this recipe yesterday and rushed home to make it as I am seriously craving bread after being on a keto diet for three months. I only had sour cream and added the psyllium husk and baking powder and some Italian seasoning as per a previous reply. It turned out perfectly and was absolutely delicious. Thank you. Hi Toni, so great you liked it! After using many recipes over the years I like yours the best. I added 1 tsp of psyllium husk & 1/4 baking powder to the original recipe. Now I double the recipe and spread it on a large baking sheet all the way to the edges, trying to make it as even as possible. After cooling on a rack, I cut 3 down(short side) and 4 across(long side) The result is that I get 12 ‘slices’ of bread very close in size, taste & texture to the old unhealthy but familiar white bread of years past! I use a spatula to remove the slices from the parchment paper. I put wax paper in between the slices, then bag & store them in the refrigerator. These are more filling than the old bread, so 1 sandwich is quite a substantial lunch. Thanks for a great bread substitute. PS: Are you on twitter? Hi and thank you so much for your comment and for your kind words! It’s great to hear that you like the bread 🙂 Yes, fridge and freezer are the best places to store flaxseed meal, thanks for sharing that and also how you are storing the bread! 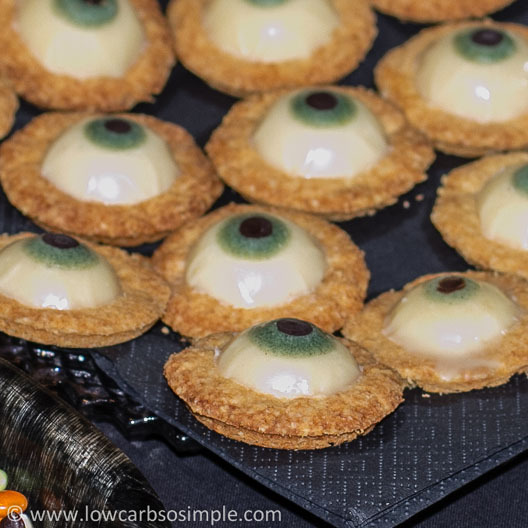 Yes, I’m on Twitter (@lowcarbsosimple) but I definitely should tweet more often than what I currently do! Hi Debra, basically you could replace them with psyllium husks — however I cannot say how much psyllium to use in this case. In any case it’s less than what you need flax seeds. Psyllium husks also might make the texture a bit rubbery. By the way, I have another recipe for flat bread: http://www.lowcarbsosimple.com/gluten-free-low-carb-flat-bread-focaccia-pizza-crust/. You don’t even have to beat the eggs, just add them to the dry ingredients and mix well. I have reactive hypoglycemic and can not find a bread that doesn’t spike my blood sugar I don’t have a printer would like to find a cook book that would fit my needs without becoming a vagon eater. 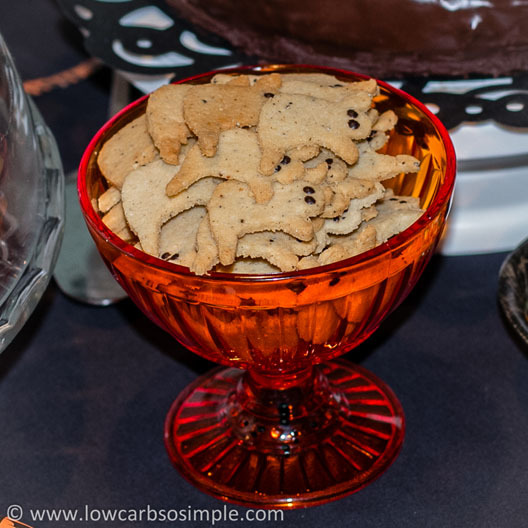 Hi Tom, there are several great low-carb cookbooks out there. I would advise you to stay away from recipes which use high-gluten flour, soy flour, cereals or any other starch. For example almond flour, coconut flour, flax seeds, nuts & seeds in general, psyllium, plant-based protein powders and also whey protein are fine, though there are studies which would suggest that whey protein contains oxidized cholesterol. You can check this link if you find any interesting books which suit your needs: http://astore.amazon.com/locasosi-20. HELP!! i just tried this bread…seemed so easy…and you offered no tips because you said it was foolproof. i followed recipe EXACTLY, oven thermometer for correct temp…and i got a tasteless, unappetizing squishy outcome! the batter was too runny even after i let it sit for a bit, hoping it would firm up…also added a bit more flax. i didn’t have to ‘spread’ it…it just ran out to about .2inches. after 25mins i checked w/toothpick and it came out clean, so i removed from oven and let cool for a few minutes. it cut ok, felt pretty firm to touch, but inside was mushy. i can’t imagine what i could have done wrong…i followed instructions to the letter. 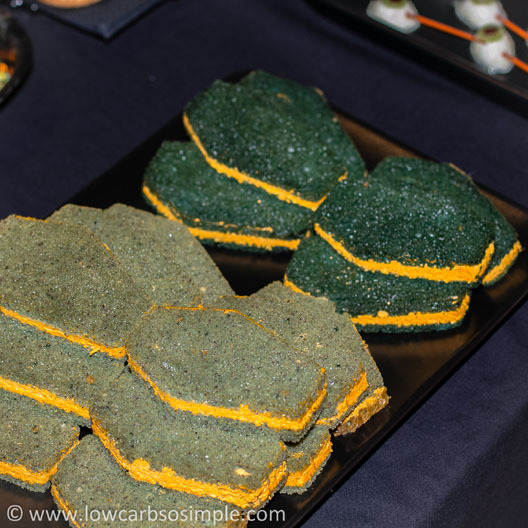 it’s kind of deja vu w/the ‘simple and fluffy GF low-carb bread’ which i never got to turn out anywhere near your photos…mine never rose more than 2.5inches. i made it w/almond butter several times, which didn’t taste that great, then gave up and switched to tahini w/caraway seeds. flavor was much better but still skinny slices and very dry. i tried with baking powder, also w/baking soda and ACV. results were pretty much the same. i probably made the bread 10 times before giving up. Hi samudra, so sorry to hear that you have been so unsuccessful with my recipes. It really sounds like there is something wrong with the measurements. 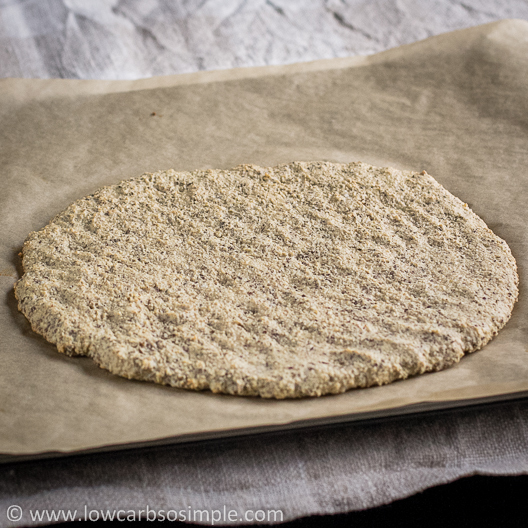 For the flatbread it sounds that there was too much fluid compared to the amount of almond flour and flaxseed, and if you say the Simple and Fluffy GF Low-Carb Bread was dry, it sounds that there was too little eggs/almond butter. I guess you used the exact amounts and brands what stated in the recipes? Did you measure by volume or by weight? Measuring by weight is often a safer option. Did you use also extra large (60 g) eggs? The flatbread is meant to be on the moist side but definitely not mushy. If you still would like to try it out, I would recommend to add ground flaxseed by tablespoon (I think 1-2 T should be enough), mix properly and wait for a minute or two until the consistency is the same than what you can see from the photos. Again, I’m very sorry to hear that you have been so unsuccessful with my recipes. I’m still trying to think what went wrong and how to improve the outcome. I really hope you have better luck in the future! Another fantastic recipe, thank you. I made this yesterday it was super easy (unlike so many other low carb breads) I added some of the bread seasoning I won in your competition earlier in the year, thank you again! Hi Annette, great to hear from you! It’s fantastic that you found use for the bread seasoning and this bread recipe appeals to you! 3 Tbsp oil, I use grape seed, but am going to try coconut oil. Melted of course! A few good shakes of salt free seasoning. Dried chives: I don’t measure, I just toss them in. The original recipe calls for a couple teaspoons of various seasonings or spices. I think she used garlic powder and caraway seeds. I can’t use caraway because my husband has difficulty swallowing seeds and nuts. 1 Tbsp Baking powder. The original recipe doubled, calls for 1 1/2 tsps, but I add more. My preference. 1 Envelope of yeast dissolved in 1/4 cup warm water. Add a few drops of stevia to feed the yeast beasties! Beat the eggs, add the water, the oil and the yeast mixture, and give it a good stir. In a second bowl, mix the seasonings, salt, and baking powder together. Add the wet ingredients and stir until combined. Divide the muffin top pans. Mine are nonstick, but unless yours are scratch free, or if you don’t mind a little extra fat, grease them. I generally grease mine anyway, because I don’t trust them, and because my grandson used a fork on mine! I let the buns rise in the pans for up to twenty minutes, and then bake them in a preheated oven, set at 325 degrees for twelve minutes. Depending on your oven, you might need to bake them a little longer, or a little less. When you take the pans out of the oven, pop the buns out and cool them on wire racks. I find it helps to prevent sticking. It also helps to give the pans a good tap on the counter top for ease of removal. recipe and bakes it in a bread pan. I haven’t tried that yet, but I do make these buns at least twice a week, so I go through a ton of flax meal. I am going to make your flatbread tomorrow, and I will probably use the muffin top pans to bake them. I imagine you could also bake them in small pie pans for a bigger roll. Anyway, I will let you know how they turn out. Please forgive any typos or goofs. I keep waking up entirely too early, so there may be some! Thank you for the detailed explanation and the recipe! That really sounds worth trying. I haven’t used golden flax seeds but I think I’ll give a try to them as well. Thank you so much for sharing! I can’t wait to make this, it looks so simple! Not having made it before, do you think you could bake it and then put pizza toppings on it and use it like a pizza crust?? Hi Kelsey, great to hear you like it! Sure, you can use it as pizza crust if you prebake it first. If you try out, please tell me how it turned out! I crave bread the most in my third year as a serious low carber. I’ve made a lot of flat breads but they were crisp so a soft one has a definite appeal. I always look forward to your creative ideas! Hi Susan! Great that my recipe appeals to you! Hope you like the bread if you happen to try out the recipe! What a great post this was! I have been making a recipe for flax flat bread, and I kept thinking that I wanted to add almond flour to it, to see what would happen. Judging from your pictures, something great happened, and I can’t wait to try it. This will be a nice change of pace, and I think it would make a great pizza crust or rolls. I make my flax breads in a muffin top pan to help them hold their shape because the batter is a bit runnier. My birthday was last week too, but not on Halloween, so I didn’t have all the super fun food that you did. Belated happy birthday to you. Ironically I am in the middle of a battle with cold and flu bugs as well. Hopefully we all feel better soon. Your recipes give me something to look forward to when I can eat again! Hi Mari, I also want to wish belatedly happy birthday to you! Hope you beat the flu bugs and are feeling better. Almond flour sure improves the texture and heavy cream is responsible for the moist and richness in the texture. The batter is on the runny side at first, but gets firmer within a couple of minutes because of the flax seeds. I wonder if rolls would need even firmer batter, I haven’t tried to make rolls yet. If you try out the recipe, please tell me how you like it! May I ask what other ingredients you use in your flax flatbread? Would you be willing to share your recipe?